Mahnaz Shabbir is president of Shabbir Advisors, an integrated strategic management consulting company focusing on planning, marketing, public relations, diversity transformation and education on a national and international basis. During the last eleven years, Shabbir has given several hundred lectures, locally, nationally and internationally to organizations interested in knowing more about diversity issues. She has been the subject of dozens of articles, both locally and nationally. In March 2005, then Kansas Governor Kathleen Sebelius appointed Shabbir to the REACH Health Care Foundation Community Advisory Committee, a $100 million foundation. Shabbir is also on the faculty at Park University teaching in the Masters of Health Care Leadership Program to include marketing and diversity in patient care delivery. She has been a lecturer at the Command and General Staff College at Fort Leavenworth and Fort Belvoir, VA. Prior to forming her own company, Shabbir was the Vice President for Strategic Planning and Business Development at Carondelet Health, a Catholic health care system in Kansas City. She had been with the organization for over 18 years. In this capacity, Shabbir planned $40 million projects like the four story medical mall at Saint Joseph Health Center. She has a Bachelors Degree in Business Administration and a Masters in Business Administration from the University of Missouri- Kansas City. Shabbir is very involved in community activities that range from the Overland Park Police Board to the Boy Scouts of America. Shabbir is a board member of the Greater Kansas City Interfaith Council, Boy Scouts of America, Truman Medical Center Board, CRES (Center for Religious Educational Studies), University of Missouri-Kansas City Women’s Center Board, University of Kansas Medical Center Advancement Board and Overland Park Citizens Advisory Council Racial Profiling and Non-Biased Policing (chair). She is also the past president of the Heartland Muslim Council and past board member of the Crescent Peace Society. She also was a board member and Kansas Political Chair for the Greater Kansas City Woman’s Political Caucus. Her work has been featured nationally in Family Circle (April 2005) and Entrepreneur (July 2005) magazines and other local and regional media outlets. 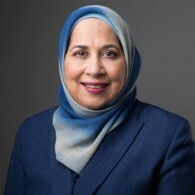 Her article, “I am an American Muslim Woman” appeared in the Kansas City Star and was syndicated throughout the United States. She has also written articles for Kansas City Voices, Kansas City Jewish Chronicle, and Ingram’s Magazine. Her articles are found in national publications such as New Light, the National Catholic Reporter, Boomer Market Advisor and Chicken Soup for the Soul. She is also the founder of Community Praying for Peace. Shabbir co-authored the chapter on Islam in The Essential Guide to Religious Traditions and Spirituality for Health Care Providers published in 2013. It is an extraordinary compendium of religious traditions as an invaluable resource to all healthcare providers. The user-friendly resource contains specific and detailed information on faith traditions vital for providing optimal spiritual care in a clinical setting. Shabbir was featured in the CBS special “Open Hearts, Open Minds” in October 2002 and interviewed in 2003 on Voice of America. In February 2005, she presented an hour-long program on the radio show, Voice of the Cape that aired in Cape Town, South Africa to 150,000 listeners. In May and July 2008, Shabbir was interviewed on Channel Islam International broadcasting to 150 countries worldwide from Johannesburg, South Africa. Recently, Shabbir was featured at the Church of Resurrection in Leawood, Kansas that was lived streamed to over 1000 viewers for their series on Understanding the Rise and Response to Islamic Terrorism. Shabbir was the Kansas City Press Club Journalist of the Year for 2003 and received other Journalism awards in 2005 and 2007. She was also recognized by The Women's Foundation of Greater Kansas City: A Celebration of Women in June 2003. In October 2003, Shabbir received the award for Community Image from the Heartland Muslim Council. In March 2004, she received the YWCA award for the Gold Honoree in the category of Racial Justice. Shabbir Advisors was nominated as “Minority Professional Service Firm of the Year” at the US Small Business Administration annual regional meeting in November 2004. In November 2005, Shabbir received a special recognition award from the Crescent Peace Society for her contributions in community service. On September 11, 2006, Shabbir received the Human Rights award from Church Women United. She received the ACLU Liberty Award for Racial Justice and honored at the CRES annual Thanksgiving dinner in 2007. In 2008, she received the distinguished Humanitarian Award from Harmony and the Midland Islamic Council-Interfaith and Outreach Award in 2011. She completed the FBI Kansas City Division-Citizen Academy in 2013 and was honored by Ingram’s Magazine in 2014 as one of the “50 Kansas You Should Know”. Shabbir was invited to join the International Women’s Forum in 2016. Shabbir is the mother to two adult sons and two teenage sons and a grandmother. She is also a certified tree farmer. Mahnaz Shabbir speaks from a place were the audience can hear their own life stories and be inspired in celebrating diversity. “ You continue to lead in the area of understanding and relationships. You continue to amaze me. Your outreach and active leadership in promoting interfaith understanding is truly remarkable. Mahnaz was an excellent resource as we developed our workplace event on the Islamic Religion and Ramadan. As our featured speaker, she did a superb job in presenting information about the Muslim people, Islam and the celebration of Eid in a clear, unassuming, professional manner. Based on all the comments, it was an overwhelming success. This would not have been possible without her involvement. Your training was excellent. It not only provided much needed information to help us address the various needs of our clients but it also challenged staff to consider personal filters. I’m very grateful! I just received the comments from the evaluation forms that people turned in at the Diversity Grand Rounds. Every single comment was “excellent” or “very interesting” or “great!” This is the highest-rated Diversity Grand Rounds we’ve ever presented! Thanks again for the tremendous job that you did – you know doctors well enough to know that they don’t dish out praise like this unless they really mean it. As a Board of Trustee member,and on behalf of the planning team, I want to thank Mahnaz for sharing her story about what it felt like to be a Muslim woman after 9-11. It takes courage to share personal feelings and perceptions with others who may not understand the depth of what happened. It is in sharing personal stories that people will begin to think about things that they may not have considered before, and the result can be life-changing for those who are willing to step out of the box and walk for a moment in someone else's shoes. Mahnaz is a remarkable woman. I have engaged Mrs. Mahnaz Shabbir on more than a dozen occasions since 2003 in my elective course-Middle East Strategic Studies-at the US Army Command and General Staff College, Fort Leavenworth, Kansas . Mrs. Shabbir has been an effective and articulate spokesperson in a variety of related subjects. As a result of her engagement with my students-middle grade KSUS military officers from all Services, and officers from more than a dozen countries-she has consistently provided a positive image countering a multitude of widespread stereotypes and myths. Students will carry their impressions of her presentation and example long after they've forgotten everything they read. Find out more about Mahnaz Shabbir at http://www.shabbiradvisors.com.